Each era had its own unique cultural characteristics, and the transition between them was often tumultuous. The position of Greece at the crossroads between Africa, Asia, and Europe has undeniably played a large role in the diverse and often turbulent history of Greece. 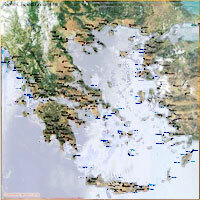 Protruding from Europe, Greece hangs precariously southward from the end of the Balkan Peninsula, and slices towards the Mediterranean Sea with dramatic peninsulas and thousands of large and small islands. The Mediterranean Sea offered an easily adaptable climate with mild winters and hot, dry summers, while the mountainous terrain, allowed for multiple easily defensible positions. The surrounding sea offered an environment conducive to developing and sustaining a enduring culture that was relatively safe from incursions while able to communicate and exchange large quantities of goods and ideas with ease through the sea lanes. It is not by accident that the ancient Greek civilization developed around a significant maritime power. While today’s Greece is confounded within the modern borders, in ancient Hellenic civilization it expanded throughout the Mediterranean. Besides the traditional mainland, the islands, and the coast of Asia Minor, Hellenic colonies existed in Italy, Sicily, France, Spain, Libya, and all around the Black Sea. With the conquests of Alexander the Great Hellenic civilization attained its widest reach. During the Hellenistic era Greek culture expanded to include Asia Minor, the Middle East, Egypt, and the land further East to the Western parts of India, and as far north as today’s Afghanistan.